Bijou Lovely: embroidery hoop wall. 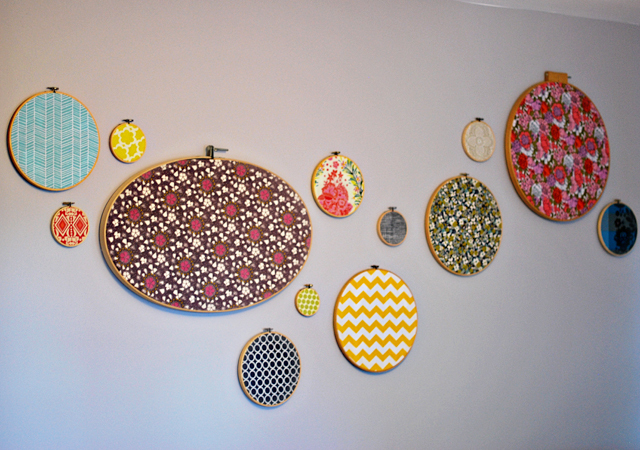 I finally starting hanging some things on the walls in my sewing room, including a wall full of hoops holding my favorite fabrics. It will look a lot more finished once I finally get the dresser that's meant to go under it in the room (it's been sitting half-painted in the basement all summer!) but either way, my wall looks pretty now! Can we talk about the fact that my local thrift store charges 10 cents for an embroidery hoop? I just can't stop buying them at that price. Great idea! I may have to "borrow" it for MY sewing room. 10 cents, sweet! I really should do something like this, it's just fun and beautiful! I did this several years over the bed in my guest room....lots of lovely Liberty prints. But I am coveting that oval hoop now! What is that aqua colored fabric? I've seen it on a few other blogs and LOVE it, but have no idea who makes it! I WISH my thrift store sold embroidery hoops. what??? 10 cents?? I bought one for 30 NIS which is around 8 dollars!!! I love what you've done with them - I did something similar with cheap IKEA frames, but they don't pull the fabric taut like the hoops do. Nice! oh i am on the hunt for these hoops now, i saw this idea on pintrest. it looks so great!